Will redevelopment enhance or erase the cultural underpinnings of Seattle’s once predominantly black neighborhood? Navid Baraty. PICTURED: De Charlene Williams has owned a hair salon in the Central District for nearly 50 years. It took a mixture of luck and dogged persistence for hairstylist De Charlene Williams to secure a small-business loan. It was 1968 and Boeing was about to begin the infamous round of layoffs that would slash its workforce from 142,000 to 56,000. Local banks were therefore willing to give loans to almost anybody who could promise some cash flow. That situation gave Williams an opening but not a guarantee; guarantees for African-American women were nonexistent. So, the 25-year-old entrepreneur started calling on lenders. Five banks said no. Then 10. Then 25. On that day at least, gender anonymity and a $7,500 down payment made Williams the owner of a hair salon. Even with financing in hand, life didn’t get much easier. Williams opened De Charlene Beauty Shop & Boutique on the day Martin Luther King Jr. was assassinated in Memphis. Shortly after opening, her windows and glass doors were smashed. Still, Williams embarked on a mission to stabilize the lives of her black neighbors in the Central District. “I wanted to help all the other black women in the area,” she recalls, “help them get out of the kitchens, get on their feet and do something productive.” Williams works solo these days, but at one point, she employed 13 people. Williams opened her shop during a period of intense racial tension, both nationally and in Seattle. 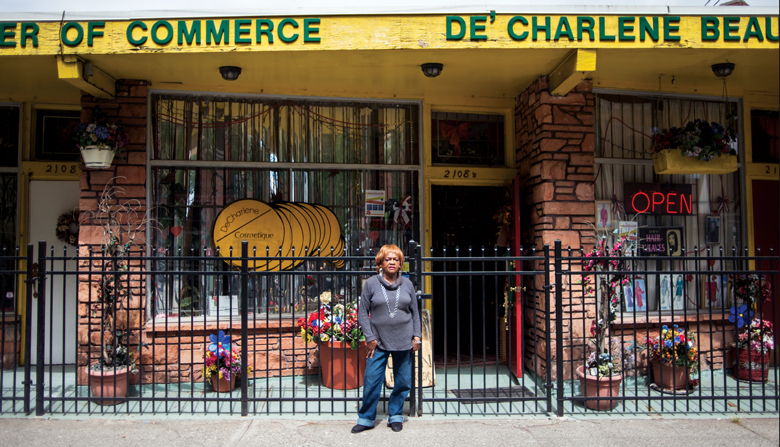 Today, her shop is a landmark in yet another instance of race-related tumult: the gentrification of urban areas traditionally populated by people of color. Williams is one of the few remaining black business owners in the neighborhood and her single-story salon is surrounded by construction equipment and boxy, six-story apartment buildings. Redevelopment has long been a thorny subject in the area, which was once three-quarters black, but the rhetoric has intensified. Such is the case when Seattle’s most prominent developer enters the market. In February 2016, Vulcan Real Estate paid $30.9 million for the Red Apple parcel and one across the street. If all goes according to plan, construction on a new mixed-use apartment complex will begin early next year. Moss isn’t a typical grocery-store manager. An ordained minister, he’s as concerned with community outreach and the fate of the neighborhood’s mentally ill as he is with SKU performance and margins. “My boss, when he hired me, he said, ‘We want somebody to run the store who’s part of the community, who looks like the community and we want to be a supporter of the community,’” Moss recalls. He organizes backpack giveaways, community barbecues and coat drives. The store has developed a loyal following among a customer base that has been consistently declining. In 1970, some 40,000 black people — comprising 73 percent of the neighborhood — occupied the single-family dwellings in the Central District. They’d make routine trips to the Red Apple, stocking up on ingredients like collard greens and smoked turkey necks that were all but impossible to find elsewhere in Seattle. Today, census estimates suggest about 5,000 black people live in the area — roughly 14 percent of the population. Michael Moss, left, manages the Promenade Red Apple Market, which may — or may not — survive as part of Vulcan's planned apartment/retail complex at 23rd Avenue South and South Jackson Street, right. Mortgages were hard to come by in the area. And when they were granted, they came with high interest rates. To offset the lack of capital, the Central District became a hub of community experimentation. The local Black Panthers chapter sponsored a community health clinic. A fleet of 12-passenger buses shuttled folks around for a dime per trip. Local residents were providing urban services before the city thought to arrange any for them. And, as has been the case in redlined areas across the United States, the pragmatism of the Central District also yielded a creative benefit. The neighborhood had a booming jazz scene in the 1920s and 1930s. Rock guitar virtuoso Jimi Hendrix called the Central District home. Resident Anthony Ray would eventually dub himself Sir Mix-a-Lot and spark a hip-hop movement that continues today. These homes were inexpensive because banks wouldn’t issue home-improvement loans in the Central District. “So, as Euro Americans received a bonus from institutional racism,” Seattle University law professor Henry McGee Jr. wrote in a 2006 analysis of the neighborhood’s changing demographics, “African Americans were presented with an escape hatch to less expensive, far more desirable housing than they had experienced when they were ‘redlined’ in areas now open to them as racial attitudes changed.” An urban-suburban flip ensued: White people moved to Seattle; black people left for places like Renton and Kent. The Great Recession further soured residents’ fortunes, and then they couldn’t keep up with property-tax and rent increases after the recession. In 2009, homes in the Central District fetched a median price of $385,000, according to the Northwest Multiple Listing Service. Through April of this year, the median sale price was nearing $700,000 as opportunistic developers stoked the trend. Many paint Amazon.com as Seattle’s greatest gentrifier, but it’s Vulcan Real Estate that erected many of the buildings those backpack-clad tech workers scurry into and out of in South Lake Union and downtown. No commercial entity has played a larger role in the revamping of Seattle’s new hub of tech activity. In the company’s eyes, Vulcan replaced a warehouse wasteland with the skeletons that support thousands of jobs and dwellings. In 2014, Vulcan expanded from South Lake Union by signing on to a $200 million redevelopment of Yesler Terrace, the nation’s first racially integrated public housing development, which opened in the 1940s. Vulcan plans to build 650 units of both market-rate and discount units on the site, which is situated between the Central District and downtown Seattle. Seattle Housing Authority (SHA), which operates the public housing at Yesler, partnered with private developers to help finance the $1.5 billion project, which is expected to last a decade. The result, developers and SHA say, will be a mixed-income, diverse neighborhood that provides better opportunities for low-income residents rather than separating them away from an economically advantaged neighborhood. Vulcan sees the property at 23rd Avenue and South Jackson Street, a mile east of Yesler Terrace, through a similar lens. Single-story shops and a huge parking lot are considered inefficient uses of space in a growing urban center. When construction begins, likely in early 2018, Vulcan will clear the parcel and erect two buildings encompassing 46,000 square feet of retail space topped by 532 apartments, 106 of them to be offered at a lower price point. For example, a two-bedroom unit for a family of four with an $80,000 annual income would cost about $1,800 a month, according to Vulcan Vice President of Real Estate Ada Healey. Vulcan officials have sought community buy-in through numerous stakeholder meetings. “One of our goals with new projects ... is to be really good listeners and to be mindful of the context and the history and the aspirations of the people who are currently in the neighborhood,” Healey says. Vulcan has a history of targeting local businesses it wants as tenants, so it’s unclear if Central District mainstays will be tapped. Vulcan wants 20 percent of construction costs to be devoted to minority-owned contractors, but there are no incentives for minority-owned retailers in the works. Nevertheless, some in the business community have hailed Vulcan’s outreach. Ice Dean's Cortona Cafe, left, is a Central District favorite for its quirkiness and community-friendly space. Fat's Chicken and Waffles, which opened last year in the iconic Catfish Corner space, is considered by some an example of "gentrification done right." Economic development in the Central District hasn’t necessarily yielded greater economic opportunity for its black residents; as money has poured in, they’ve poured out. Does a developer have an obligation to those who are displaced? There are two coffee shops on East Union Street between 24th and 25th avenues, and they might be bellwethers of the neighborhood’s small-business future. Cortona Cafe, run by Isolynn “Ice” Dean, is a small shop enlivened by big windows, bright yellow accent walls and inventive use of available space. On the west end of the block is Union Coffee. Zack Reinig, whose spouse, Molly Moon Neitzel, runs the eponymous ice-cream-shop empire, opened last year. Union epitomizes the style of new coffee shops in Seattle: concrete floor, white-tile backsplash, high ceiling. The neighboring shops illustrate a collision that happens in gentrifying neighborhoods, one that often produces a single winner. The difference is capital. “These [new] shops ... have enough money to make it appeal to the new people moving in here,” says Dean, who is black. Wealthy incoming residents seek businesses they’re familiar with, and wealthy entrepreneurs can cater to that demographic. Meanwhile, existing retailers must reinvent as demographics change, which is a capital-intensive process. Furthering the divide, people of color usually have a fraction of the net worth of white Americans, thanks in no small part to the discriminatory lending practices of past decades. Even today, white people have been shown to receive preferential lending terms. New money means new opportunity for business owners like Williams and Dean, but they have historical burdens to shrug that their new competitors often don’t. Some are attempting to level the playing field before it’s too late. In June, developer Lake Union Partners partnered with the conservation organization Forterra and the Central District activist group Africatown to set aside for affordable housing nearly half of a new development at 23rd Avenue and East Union Street, the former site of Liberty Bank, Seattle’s first black-owned bank. “Bold partnerships like this are necessary if Seattle is to truly mitigate displacement, nurture diversity, and create lasting business and residential affordability,” Africatown board member Andrea Caupain said in a statement announcing the deal. The collaboration will help cash-strapped residents — some units will rent for as little as $720 a month — but it’s just one project, and it’s reliant on nonprofit funding. What remains unknown is whether the private sector can preserve some of the Central District’s intrinsic character. “Unless somebody is coming in and investing in black-owned businesses, people-of-color businesses, we’re going to completely fade out,” predicts Dean, whose Cortona Cafe is in the next block. She argues that new businesses and developers should recognize what they’re displacing and should invest accordingly. The Central District is but one example of economic development resulting in residential displacement. Researchers commonly put the onus of gentrification on shifting norms around inner cities. After the 1960s and ’70s, when the United States government and many American cities passed laws banning discrimination in home lending, inner cities were still seen as low-income areas that middle- and upper-class whites ignored. Redlining may have been banned, but its effects lingered for decades. Beginning in the late 1990s, attitudes started to shift. Longer work hours and an increased appetite for urban amenities drove working professionals, particularly young ones, to reside closer to central business districts. Thus, proximity kick-started gentrification in neighborhoods across the country. Public policy experts grapple with the fact that gentrification isn’t a rising tide that lifts all boats. In theory, wealthy residents moving into central cities would spark racial and financial integration that benefits all residents. “But, often, newcomers take over political institutions and advocate for amenities and services that fit their definition of community improvement,” writes Derek Hyra, director of American University’s Metropolitan Policy Center. The mere presence of wealth doesn’t improve the fortunes of those living in low-income neighborhoods. Social scientists have found that interactions — whether conversations on the bus or a new business hiring a local contractor — drive economic improvement across classes. If newcomers interact only with other newcomers, longtime residents get left behind.